We know kids are excited because it’s the end of the school year and summer’s almost here. But we’re even more excited because a new program we’re offering here at Cutting Edge this summer! This summer (June 12th-July 24th) we’re going to offer a Social Skills Group! This is different from our camps, that are a week long. This Social Skills Group will meet weekly for one hour, and it will last for six weeks! We’ve separated this into two groups, a younger group in the morning and an older group in the afternoon/evening hours, so we can work on appropriate social skills by age. Both groups are going to focus on concepts of Social Thinking, which was developed by Michelle Garcia Winner, a renowned speech pathologist. 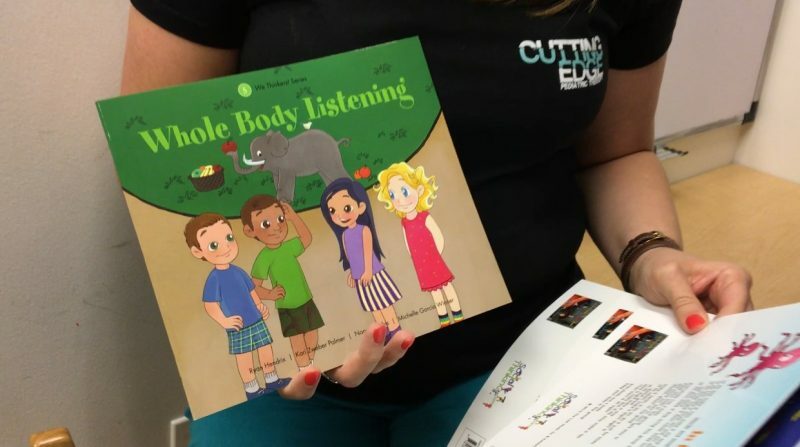 The core of the program is to help kids learn how to think about other people’s thoughts and to think about how our behavior affects other people in social situations. In the older kids’ Social Thinking group we’re going to talk about things like smart guessing, being able to interpret what the other person might be thinking, behaviors that we expect or don’t expect, and flexible thinking, among other topics. Each week we’ll focus on a different topic, and then we’ll work on generalizing that topic throughout the camp. In our younger group some of the things we’ll be focusing on are differentiating between thinking thoughts and feeling feelings, thinking about the group plan and what everybody in the group wants to do, thinking with your eyes, body in the group, and whole-body listening. What we really like about these books for our younger kids is that we’re going to use them to have a theme for each week. For instance, we might have a space theme one week, a zoo theme the next—this will keep it fun for our younger kids! Each week in the social skills class we’ll incorporate a book, a game, an activity, and a snack. This way the children know what to expect while they’re learning these new skills. We’ll also send home a parent handout each week, to give you ideas about how to generalize these skills to the home environment and other settings. If Social Skills Group is something that you think would benefit your child, give us a call here at the clinic! We look forward to seeing you this summer!